Winner of Swing Journal 2008 Jazz Disc Vocal Award! 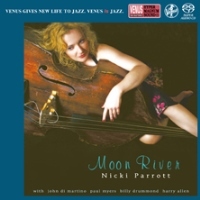 Australian-born and New York-based Nicki Parrot is a double threat: She can play the bass very competently, and has a singing voice that shares the relaxed sexiness of Julie London and the coquettishness of Blossom Dearie. She has performed and/or recorded with the legendary guitarist Les Paul, pianist Rachel Z and her sister Lisa Parrott. Venus' producer Tetsuo Hara got to know Parrott when he recorded the Rachel Z band which included her. For this auspicious label debut CD, Parrott was teamed with wonderful musicians that include John di Martino, a wonderful pianist and arranger who has recorded several times for Venus. Paul Myers' guitar work is exemplary, and Harry Allen contributes with tasteful solos and obligatos. As Jay Leonhart often says, many people believe it's impossible to play the jazz bass and sing at the same time. But Parrott, together with Kristin Korb on the West Coast, proves them wrong. This is a very enjoyable, straight ahead jazz CD with great singing and strong performances throughout. Recommended! Produced by Tetsuo Hara and Todd Barkan. Recorded at The Studio in N.Y. on June 7 & 8, 2007. Engineered by Katherine Miller. Mixed and mastered by Tetsuo Hara. Gate-fold paper sleeve edition. Single Layer SACD. 2. Is You Is Or Is You Ain't My Baby?